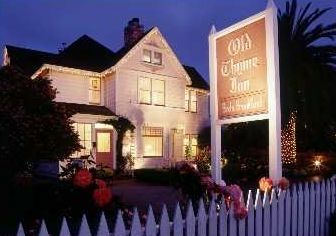 Old Thyme Inn is an 1898 Queen Anne Victorian bed & breakfast. Our fragrant English-style herb and flower garden provides a tranquil setting for romance, rest and relaxation, or pleasant conversation beside gurgling fountains. The peaceful coastal village of Half Moon Bay is just 28 miles South of San Francisco and less than an hour from San Jose and the Silicon Valley. The Inn is furnished in antiques and the innkeepers' collection of fine art. We offer seven guest rooms, all newly and uniquely decorated, each with queen bed (with hypo-allergenic featherbed and down comforter), color TV-VCR, and private bath. Some rooms offer a relaxing Jacuzzi-for-two or cozy fireplace, two rooms have both. And our delicious full breakfast, served every morning, is the perfect way to start your day. This and other Half Moon Bay Bed and Breakfast Inns can be found here in The Register.